Launched for Model Year 2015, Sportsman XP 1000 leads the Big Bore category in power and performance. Based on the revolutionary XP chassis, the Sportsman XP 1000 offers the smoothest, most-refined ride in the industry coupled with the highest performance in its class due to its 88 horsepower ProStar® single overhead cam 1000 twin-cylinder Electronic Fuel Injected (EFI) engine. Other features found on the Sportsman XP 1000 are the new high-performance, close-ratio, On-Demand, True All-Wheel Drive (AWD) system for improved traction; Electronic Power Steering (EPS); Polaris’ Engine Braking System (EBS) with Active Descent Control (ADC) to control downhill braking for optimal control and smooth, even deceleration to all four wheels; a Polaris HD 2500 lb/1133 kg winch and new plow accessory integration so the vehicle can work harder. · Polaris Interactive Digital Display with GPS- An integrated, industry-leading LCD display and gauge with full-featured GPS, mapping capability and compass. The display also features integrated Bluetooth functionality and shows the speedometer, tachometer, dual trip meters, odometer and maintenance warnings along with a digital clock, and operating conditions including fuel level, diagnostics and more. Also launched for Model Year 2015, the Sportsman Touring XP 1000 shares the same class-leading power; smoothest, most refined ride; high-performance, close-ratio, On-Demand True AWD; EPS; EBS with ADC; winch and plow integration, but offers a longer chassis to accommodate a passenger. For Model Year 2015, Polaris added a new premium, one-up vehicle to the 500 class, the Sportsman 570 SP. 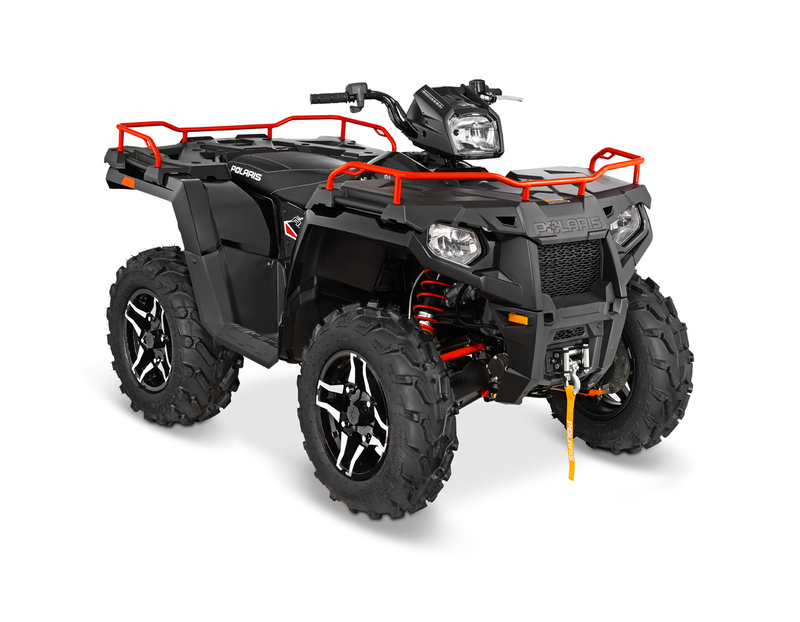 The vehicle features several upgraded refinements found on premium model ATVs including Double A-Arm Front Suspension; standard Electronic Power Steering (EPS); high-performance close-ratio, On-Demand, True AWD System; EBS with ADC; premium automotive paint and cast aluminum rims. The three-passenger RANGER Diesel HST and RANGER Diesel HST Deluxe offer customers considering a utilitarian side-by-side the most comfortable and easy-to-use options on the market. The vehicles will continue to offer key features that are important to the agricultural and rural lifestyle customer such as diesel power with a hydrostatic transmission, hydraulic power steering, an industry-exclusive treadle pedal, multi-link coil over De Dion rear suspension and premium Lock & Ride® PRO-FIT™ cab system, complete with climate control and new hinged doors with operable windows, which is standard on the RANGER Diesel HST Deluxe. New for 2015, both vehicles feature a 3-cylinder, Tier 4 compliant KOHLER® Diesel engine with double the alternator output, 110 amps, to power more accessories.